Encourage your little chef to cook up some delicious treats with the BRIO Role Play – 31360 Kitchen Combo. ? Made with FSC® certified wood. ? 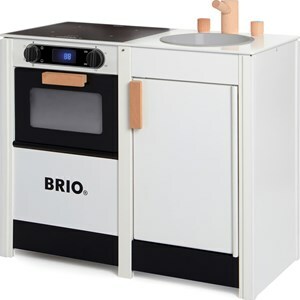 Features a digital timer, rotating dials, removable sink and opening cupboard/oven. ? Digital timer makes a noise to let you know the food is ready. ? Encourages social skills through play. ? Combine with other toys in the BRIO Role Play series for hours of creative play. ? Measures 60 x 30.3 x 59.6 cm. ? Suitable for ages 3 years and up. ? Conforms to the safety requirements of ASTM F963. ? CE certified. ? Requires 3 x AAA batteries (not included).